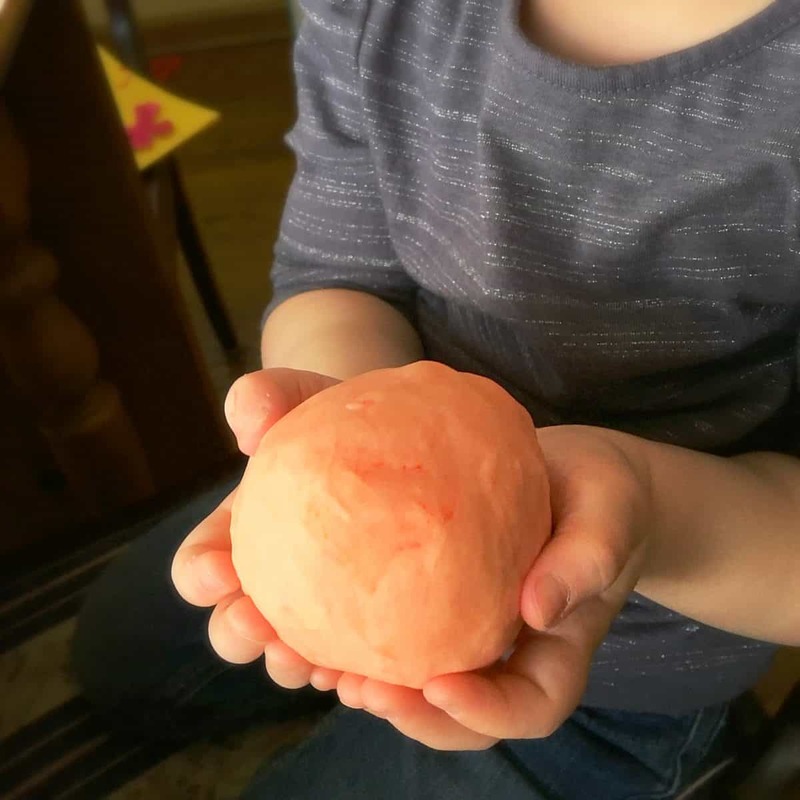 I love the idea of homemade playdough. What I don’t love is having to make it all the time. I wanted to come up with a way to mix up a couple balls without having to spend a lot of time. 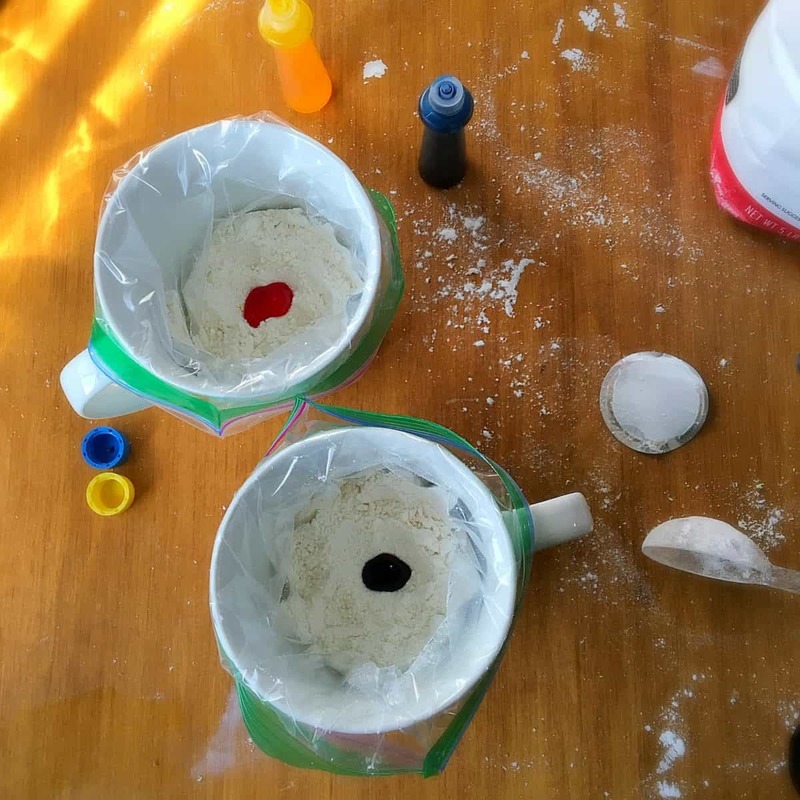 So I made some playdough packs. Then I threw in a surprise! 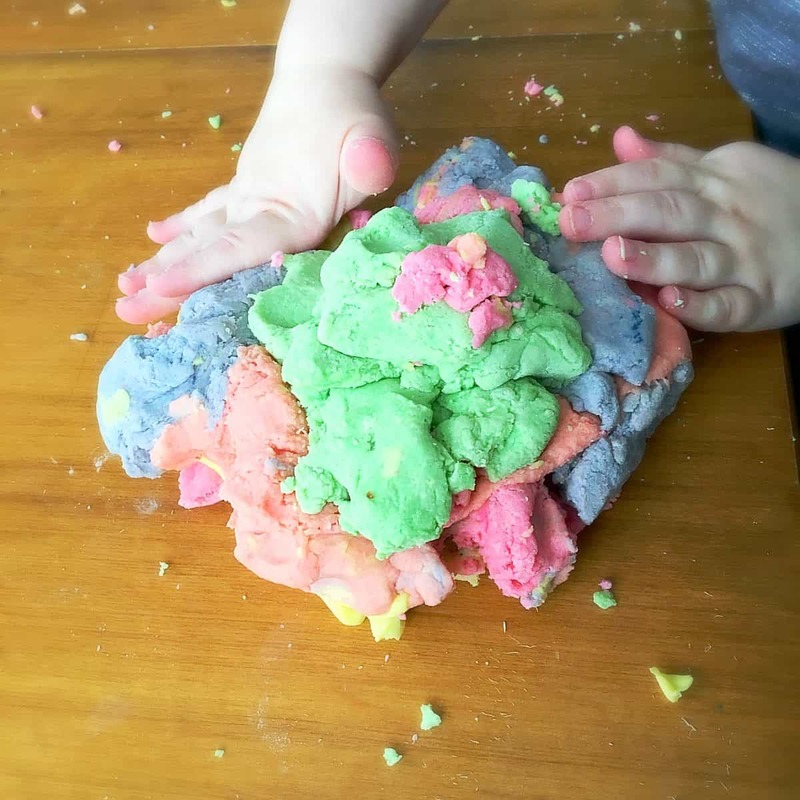 I started with a playdough recipe from Kids Activity Blog. I didn’t need to reinvent the wheel, and I wanted a recipe from a site that I could trust to get it right. I’m glad I did. The recipe was perfect! 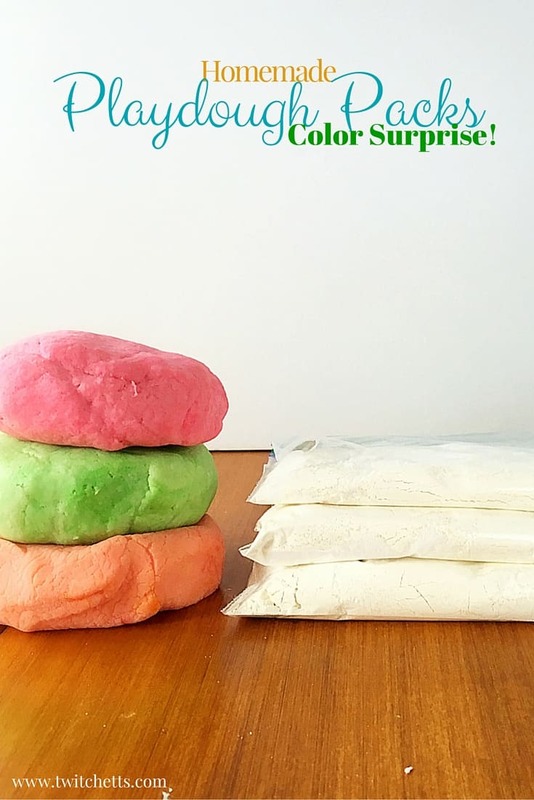 The best part of these playdough packs was the fun color surprise. 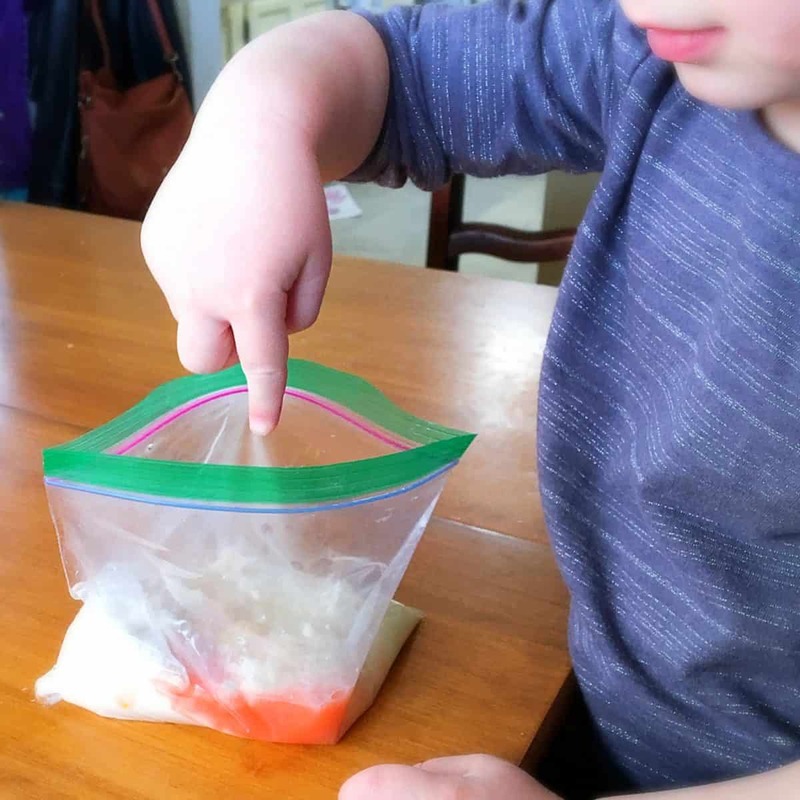 When I made the packs, I added the food coloring. So when we added the oil and water, the colors appeared! It was so fun to hear Little Miss shout out the colors. Sometimes the colors came out as soon as the water was poured in. 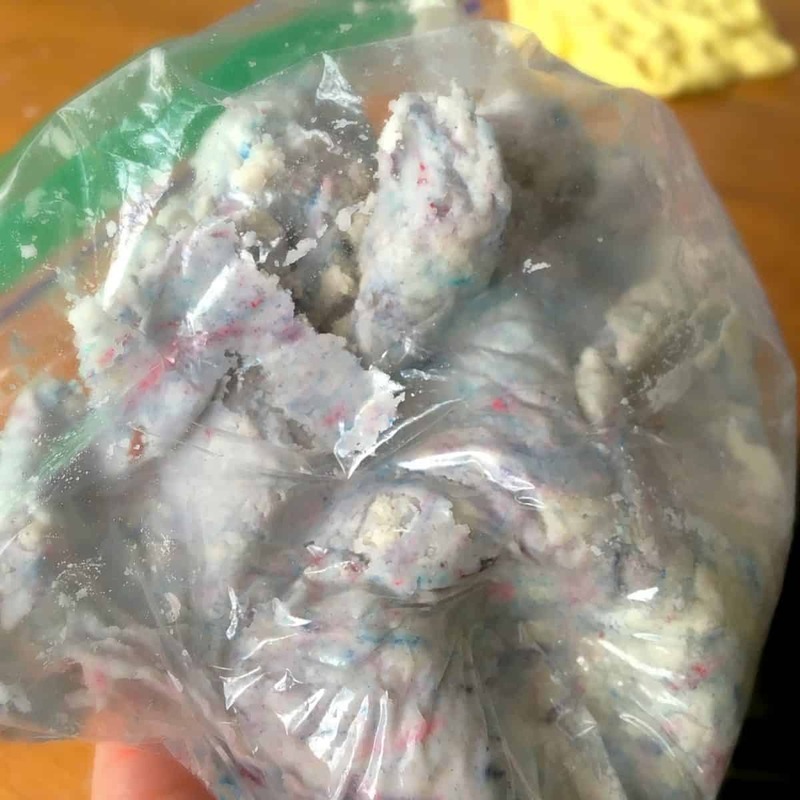 Sometimes you had to wait until the dough was mixed up a bit. Either way, the kids watched with eager eyes as they waited. 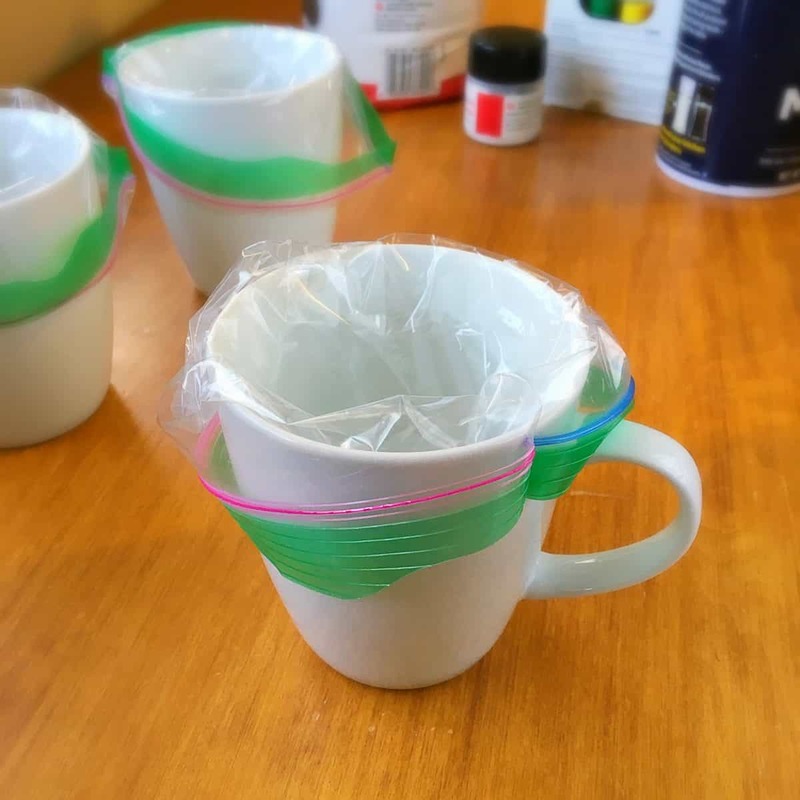 Start by putting a sandwich bag inside of a cup. Add 1/4 Cup of you flour, salt, and cream of tartar. Give it a good mix. Next, add your food coloring. Make sure you’re using the gel kind. This will help prevent the dye from running too much. I used about 10 drops for each bag. Don’t be afraid to mix up the dye a little too. Create some fun purples or oranges. Finally, add the remaining 1/4 Cup of flour and close up the bag. 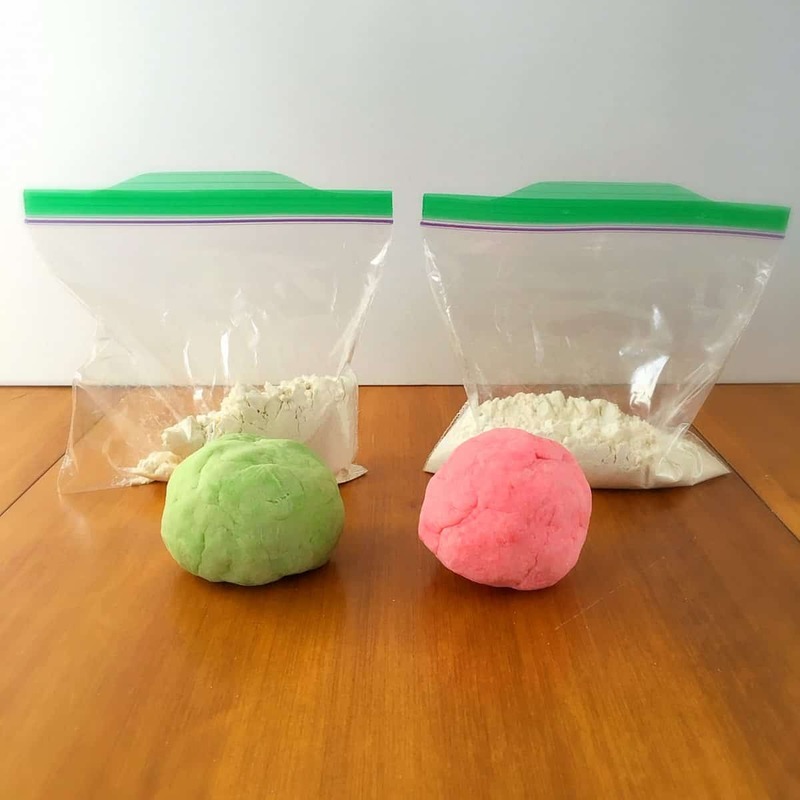 How to turn your playdough pack into actual playdough. A smidge more than 1/3 Cup boiling water. 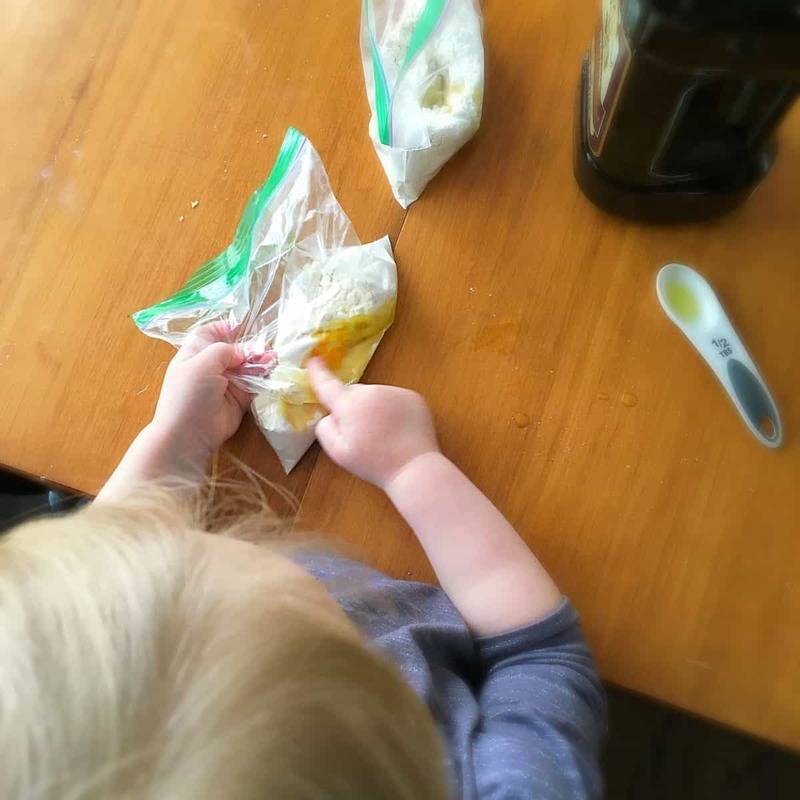 Start by adding the oil to the bag. Then, very carefully, add the water. I know the water isn’t very exact. I found that just at 1/3 Cup left the dough a little dry. If I added a bit more, it was perfect. Feel free to try it out. Just remember, it’s easier to add more than it is to take it away. So add just a little at a time. Close the bag and knead the dough inside the bag. The bag will be pretty warm. But definatley managable. It may be too hot for little ones to knead on their own. 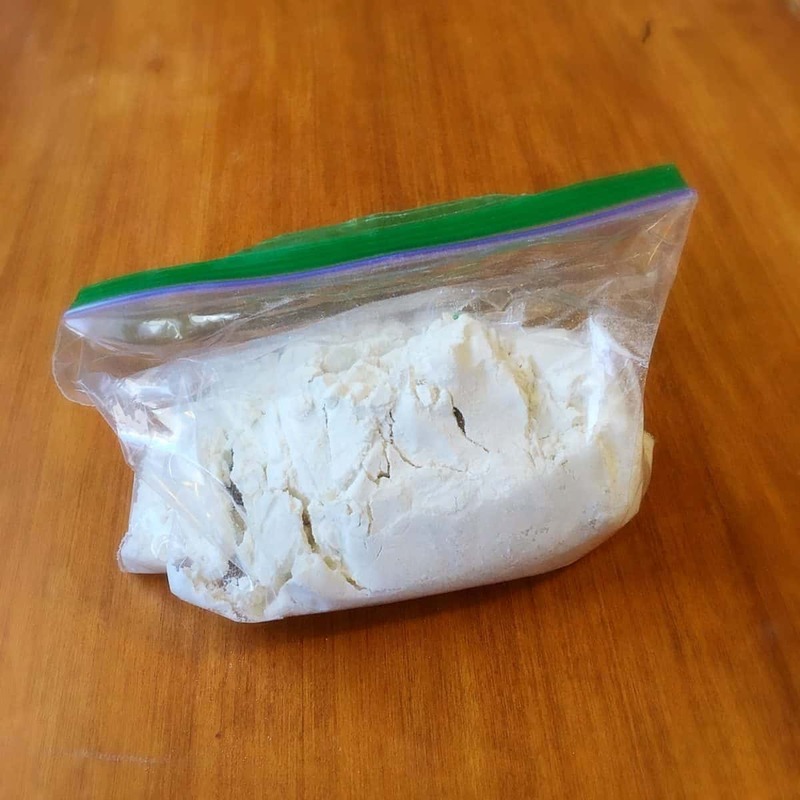 Once the dough has stopped sticking to the sides of the bag, I finished kneading outside the bag. Or I let the kids help. That’s it! 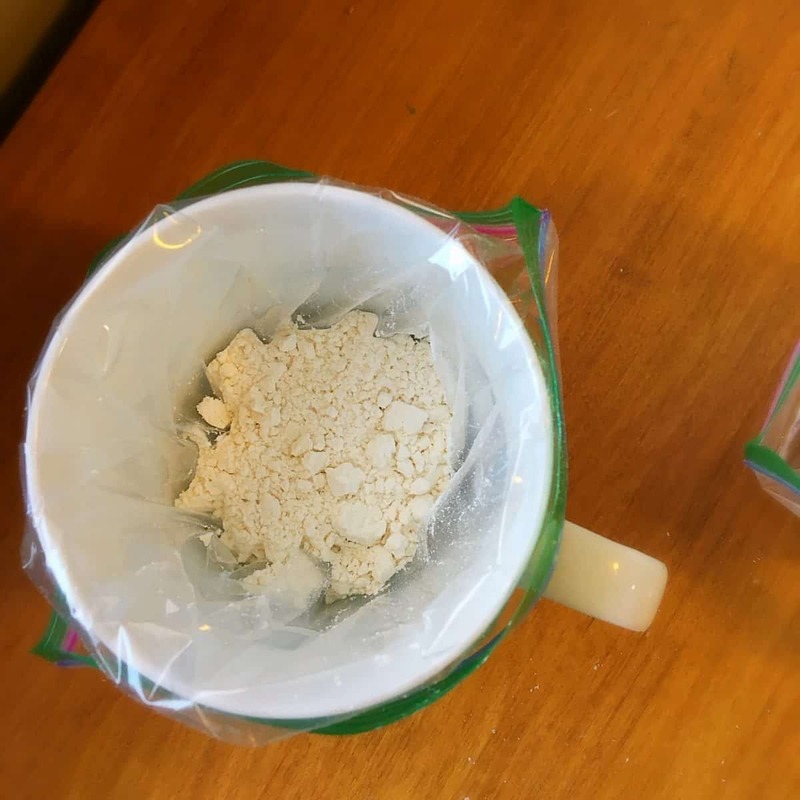 Mix up a bunch of bags and pull out a couple for a fun boredom buster. Or mix them all at once and let them have a free for all! If you’re looking for more boredom busters. 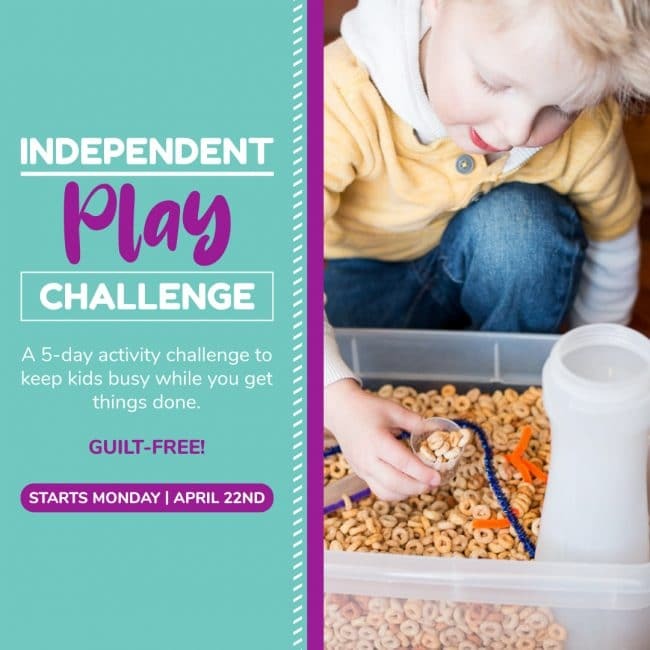 Check out this great collection of activities! I love the size of these packs. Some days you just need a quick surprise for your kiddos.